Safety & Security: Arm Our Schools’ Security Guards? Rising incidence of campus violence moves an uncomfortable discussion to the fore. We try so hard to maintain safe and secure campuses, but things haven’t gone so well recently. Between the first of the year and mid-March, the nation’s schools experienced at least 18 shootings. While the vast majority of campus shootings occur at public schools, independent schools have been shaken, and many are wondering whether they should add armed security guards. At de Toledo High School we have a mix of armed and unarmed guards. Our board made this decision about five years ago based on the recommendation of our private security consulting firm, Chameleon Associates. The main reason for including armed guards was to ensure protection during the time between a situation and the likely arrival on campus of police respondents (estimated at five minutes in Los Angeles, the third-largest force in the nation). I heard from Sgt. Ben Covarrubias of the Los Angeles School Police Department that during an active shooter incident a life is lost every three to four seconds. “Having an armed officer on scene to respond may save lives,” he said. Our school decided we couldn’t afford to wait. Here are a few questions to consider if your school is considering armed guards. Will Our Culture Support Armed Guards? I know of some schools where the decision is dividing parents; some have said they will take their children out of the school based on the decision either way. This question may be foremost for independent schools. Every year during faculty week, I share that without a safe campus, we can’t have education. Safety is the cornerstone of our schools’ abilities to serve their missions. Yet when it comes to security officers carrying guns on campus, conversations can be divisive and fraught with emotion. I know of some schools where the decision is dividing parents; some have said they will take their children out of the school based on the decision either way. In addition, certain schools are based on religious or other tenets that are incompatible with violence and will not consider security officers period, much less armed officers. Do We Need Armed Guards? Attackers look for places where they can inflict a great deal of damage relatively easily and quickly. This often means places where a lot of people gather, and defenses and a security presence are low. Consider what type of target your campus is, and what you can do to mitigate or minimize any threat. Have there been specific threats to your school? Is your property private or open to the public? What perception are you trying to attain with armed security? It is also helpful to understand what kind of a “target” your school might be. Security experts would consider a “hard target” school as one that is guarded or has considerable security measures in place. It would be difficult to carry out an attack without being intercepted. A “soft target” school has little or no security protection. Because it is vulnerable, it would be relatively easy for an attack to be carried out. What Are the Budgetary Implications of Armed Guards? Many armed guards have backgrounds in the military or law enforcement. Employing them can get expensive. 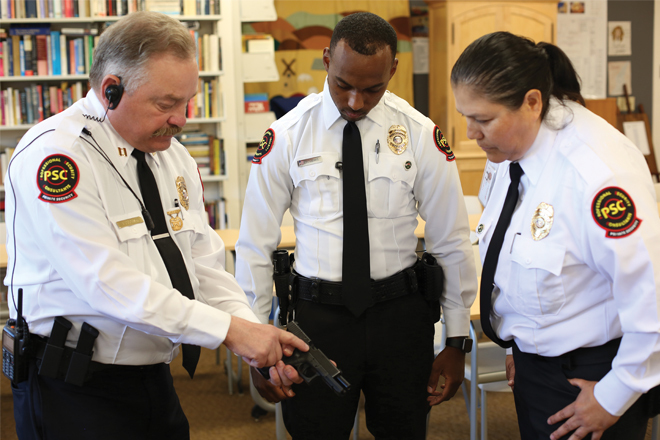 Our security budget has a separate line item for training and equipping all officers, especially those who are armed. We also provide them with high-quality body armor, an expensive but important cost. Consider the insurance implications. Armed guards on campus will directly affect your school’s general liability and workers compensation insurance. Regardless of whether guards are in-house or outsourced, check to see if your general liability company will insure your school. Expect increased premiums for workers compensation for unarmed guards, and even more for armed guards (again, regardless of employer). What Other Risks and Requirements Should We Consider? We are fully aware of these realities at de Toledo, which is one reason we invest so heavily in ongoing training. In fact, along with thorough background checks and mental health evaluations, training is the most important ongoing item for armed guards. Officers need to train well beyond the baseline requirements for “permit-to-carry” security guards. We require minimum quarterly visits to a target range, even paying for target range membership and practice ammunition to encourage them to go more often. Beyond accuracy training, also provide tactical training, all coordinated with a professional who knows this specialized field. Coordinate with your local police department. What do the police want your security officers to do when they arrive on scene? All this represents only a taste of the conversation that must take place if you’re considering armed officers. Every school's analysis will be different. David Marcus is campus business manager at de Toledo High School, a Los Angeles-area day school with 400 students in grades 9–12.